A note from Pam: Lauren is an excellent friend. We met in Paris and have bonded over a love of food, drink, fashion, and debauchery ever since. 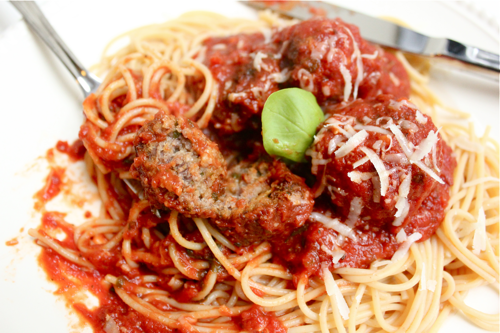 I teased you a while ago about the DELICIOUS sauce and meatballs she cooked up, and since you’ve been very patient and mostly polite, she has decided to share her recipe. Rejoice and salivate simultaneously! From Lauren: Hello, Blogosphere! I haven’t written anything on a blog since I had a LiveJournal when I was 14. Yes, that happened. I shut it down for my sake as well as yours. I’m Lauren, and I am the single worst guest writer on the planet. BallFest 2k11 took place in mid-September, and I’ve been sitting on this recipe ever since then! So sorry. Initially I blamed it on work, then on grad school apps, then Thanksgiving, then general laziness, but I’m here to share with you some ball glory. I also apologize in advance for any and all horrible jokes I make, particularly in the ball category. Storytelling and censorship are not my fortés. My family is primarily Italian – my grandmother is first generation American, and I believe her family is from around Rome, and my aunt is Sicilian. More importantly, I am from New Jersey, and folks, the Jersey Shore is real and so are guidos. Lucky for me, this means I grew up around completely delicious pizza, pasta, rice balls, and sauce. Moving to DC was really hard for me gastronomically – I remember walking up and down M St. dragging along one of my poor friends, literally inquiring at every Italian restaurant if they had Penne ala Vodka. No cigar. If anyone happens to know of a good place, please let me know – I would love you forever! Though I’ve always enjoyed good food, and living in Paris certainly took that to a new level, I didn’t appreciate cooking with fresh ingredients until my senior year of college. 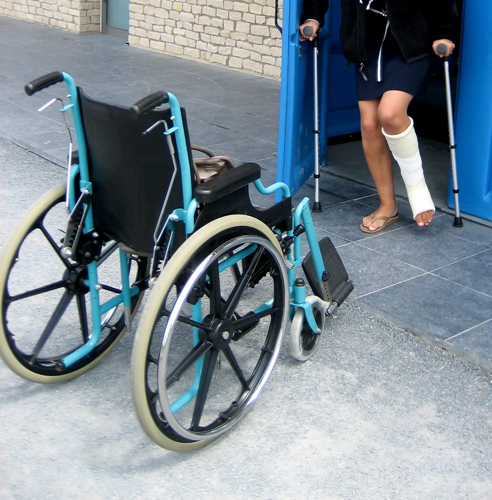 I was in a motorcycle accident in France (if you know Pam, I’m sure you’ve heard this story). My leg cast and wheelchair, however, in no way prevented me from gorging on croissants, Comté, and Lord knows what else. Needless to say, my diet needed some shaping up when I got back, and I started eating tons of vegetables. It completely changed how I felt physically, and as a result, shifted my eating habits for good. I have only just realized how rich the foods I used to eat were. While at home for Thanksgiving, my mom was talking about how she rarely saw her mother using fresh vegetables or herbs. In retrospect, neither of my grandmas really used fresh ingredients in their cooking (ham with pineapple rings and maraschino cherries anyone? ), but it was still amazingly delicious. Maybe this is a product of the era they grew up in – I’ll never forget my grandma saying that during WWII, her butcher would have a sign up saying, “Ladies, bring your fat cans here!” referring to cans of fat they’d bring in from their meat. Purpose? No idea. Who cares, freaking hilarious. I’d totally get that framed for my kitchen… very inviting for dinner guests! Moving on. The point of all of this is to say, my family’s meatball recipe is not exactly gourmet. When we were cooking during BallFest, our friend excitedly asked what was in the recipe, and she was surprised by how simple the ingredients are. 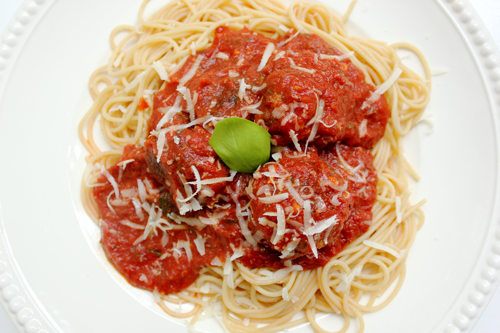 But I promise, the sauce is deep and flavorful, and the meatballs are rich and delicious. 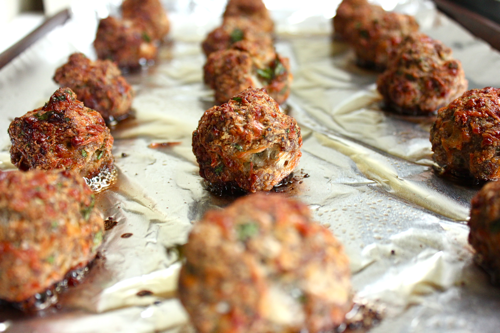 And, as an aside, these make excellent, excellent meatball subs at 2am. I speak from experience. Make the meatballs first. Preheat the oven to 400ºF . 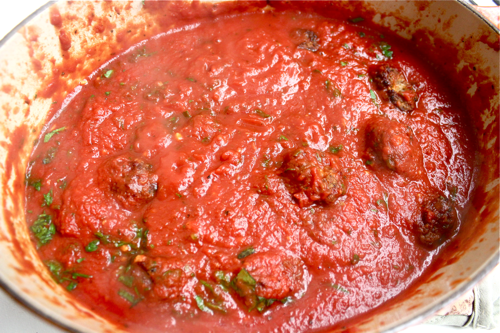 Mix all of the meatball ingredients in a large bowl, and be careful not to overmix, which can create tough meatballs. 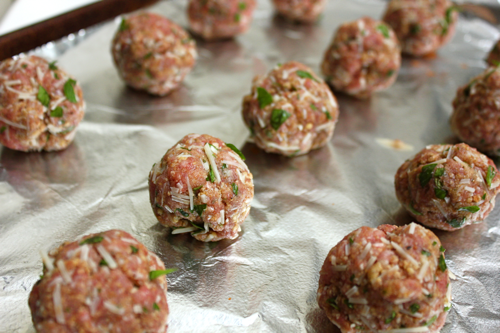 Shape the meat into balls about the size of ping pong balls, and place them on a greased cookie sheet. Bake these for 30 minutes, and then drain them on a paper towel. To make the sauce, first lightly brown the garlic in oil and then remove it from the stove. Once the pot has cooled a bit, put it back on a medium flame and continue stirring (with a wooden spoon!) while you add salt, pepper, oregano, basil, tomato paste, and the crushed tomatoes. Bring this to a slight boil, and then let it simmer, covered, for 1 hour. After the hour, add in the sugar and the meatballs. Cook it for another 30 minutes. Check the taste as it cooks – if it tastes sour just add in more sugar. These balls are best served over pasta, preferably with good friends, wine, and cardamom ricotta gelato. Loved loved loved this!! Can not wait to give this recipe a try. Thank you!